I can 100% promise that you are not as happy to be reading this post as I am to be writing it!!! It's been a LONG haul but we are finished, people. F.I.N.I.S.H.E.D. Well, except for that one tiny detail called a shower glass panel, but I figured that shouldn't keep me from showing you how things turned out. The glass panel is scheduled for installation on Monday so make sure you come back and see it! One more important thing to note...I'm NOT superwoman and these two remodels DID NOT happen in just 6 weeks like the ORC typically operates. In full disclosure, we've spent a full 12 weeks from start to finish. 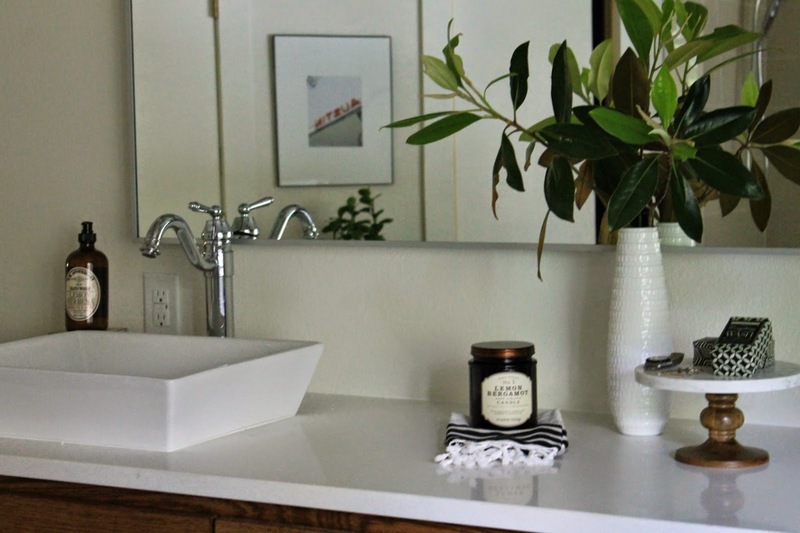 Custom vanity paired with Vicostone quartz countertops in Titanium. Sconces from AllModern. Can you believe I originally considered keeping the previous cabinets? That would have been tragic. You'll have to scroll way down to refresh your memory of what they looked like. I was trying to save money, but honestly, keeping them would have ruined the whole design. So glad I came to my senses! I love the glow the sconces put off. I ended up using the Hovet mirror from Ikea. 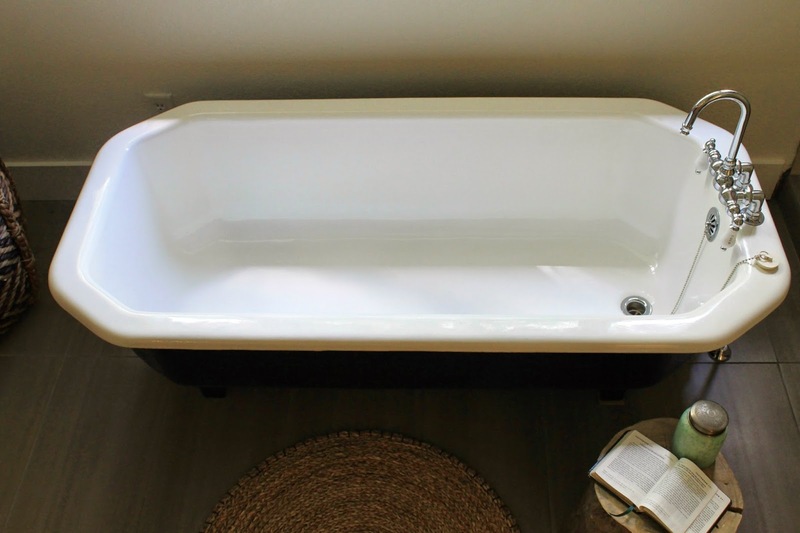 My salvage yard tub makes its debut! The unique shape sold me instantly. 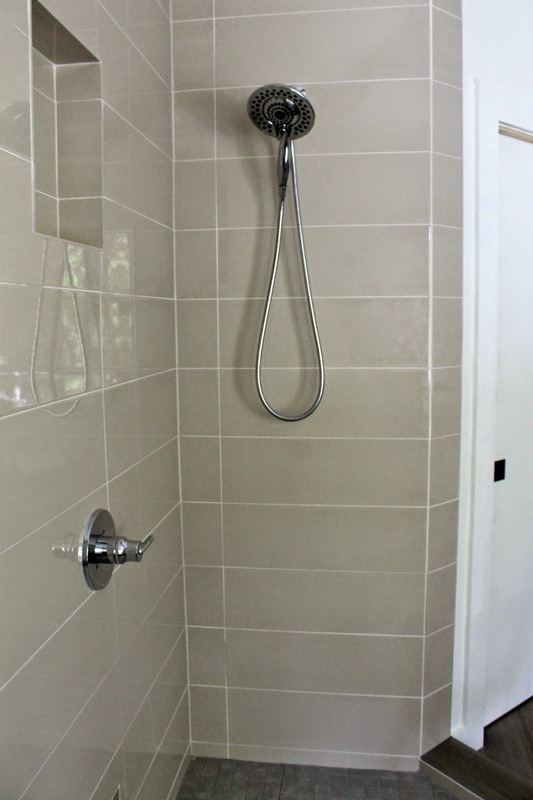 Here you're looking at the back portion of the shower which will also be the way we'll walk into the shower since the glass panel is freestanding without a door. I'm planning on using the hand hooks and bench area as a dressing space. 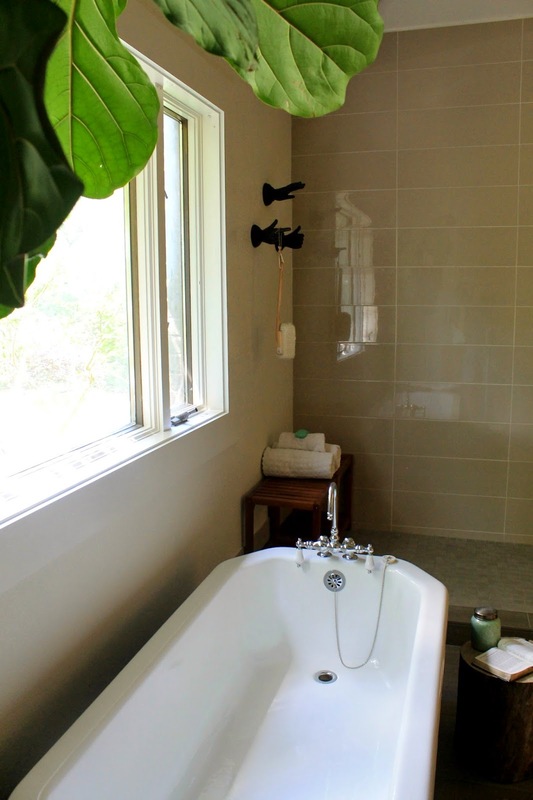 We'll hang our bath towels on hooks that we'll place on the tile wall. If you've read this blog long, you know I love a little bit 'o quirk in a space. These hands make me smile. Hold on, Mr. Showerhead, one day you will get used! It's such a tease having an "almost" completed bathroom with the most important item missing. The devil's in the details, right? I thought painting the edge of the door was a great idea until I had to start taping! John was super thrilled to see our gold handles spray painted black. He's been asking me to paint them since we moved in (almost 2 years ago). I found this little plant stand at an estate sale in our neighborhood awhile back. I wasn't sure where I was going to put it but now it's found the perfect spot. Here's a wide shot so you can get a full understanding of the space. 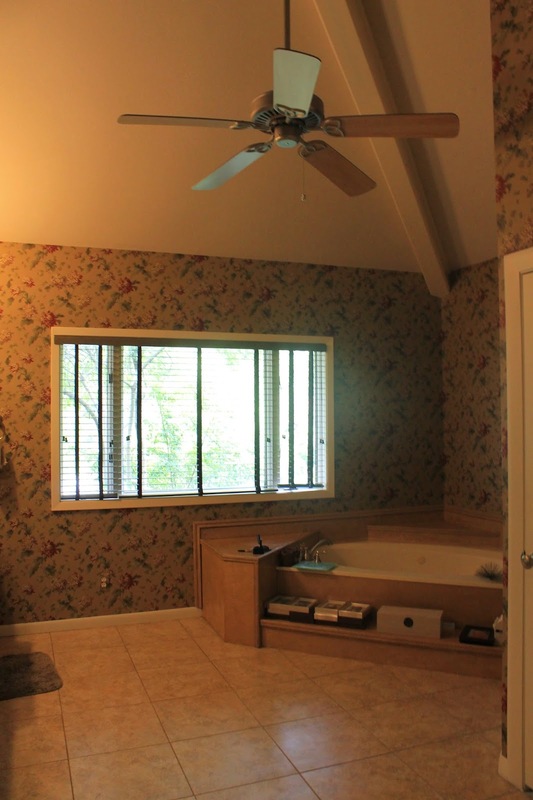 Can you believe we started out with flower wallpaper and a HUGE jetted tub? We've come a long way. Now, we'll move on into the guest bathroom. Our main goal here was to 1) get RID of the mirrors (see below) and 2) add a shower so guests didn't have to share with us or the kiddos. I got a little creative and funky with this space. It's typically my goal to come up with original designs that keep things fun and unexpected. 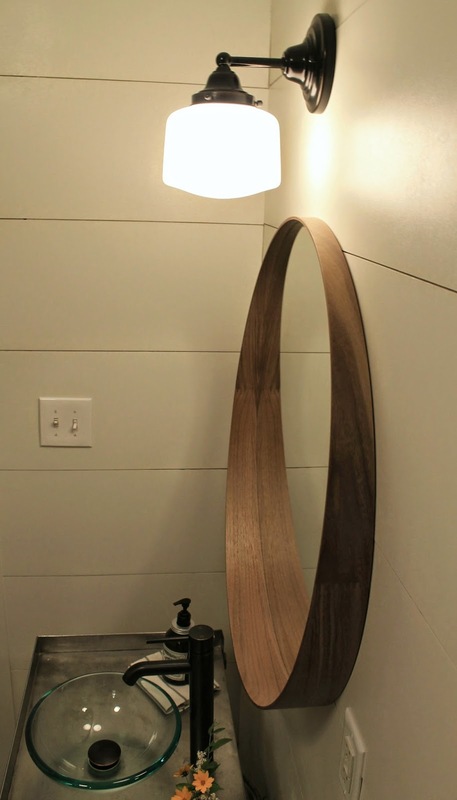 And, I'd say our utility cart turned vanity does just that...provides the unexpected. I'm fully expecting our guests to scratch their heads a little and wonder what I was thinking?! Honestly, this was an element that wasn't part of the original design plans. It just popped into my head one day and I couldn't shake it so that's when I started scouring craigslist. It was meant to be when I ran across this one and it was the perfect size. Love how the stained stripe breaks up our white wall and helps tie everything together throughout the space. 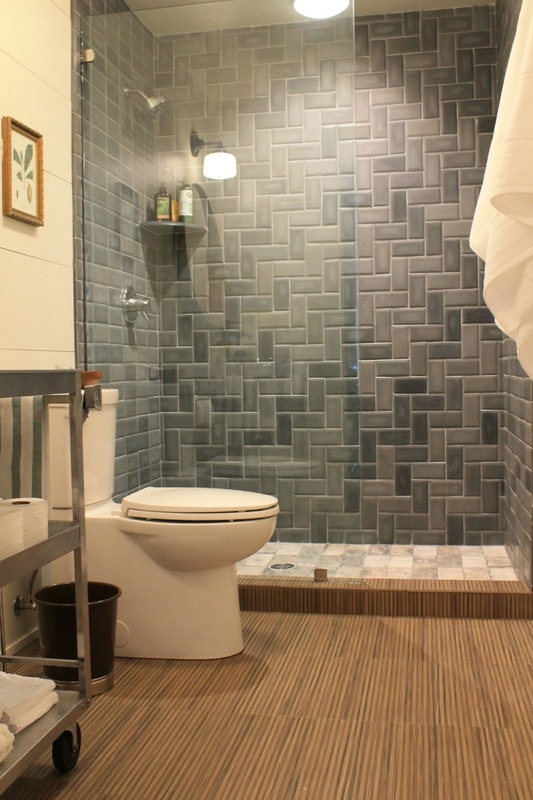 It's super hard to see in these pictures, but there's a frameless shower panel between the toilet and the shower. See the little chrome piece on the curb, holding it up? 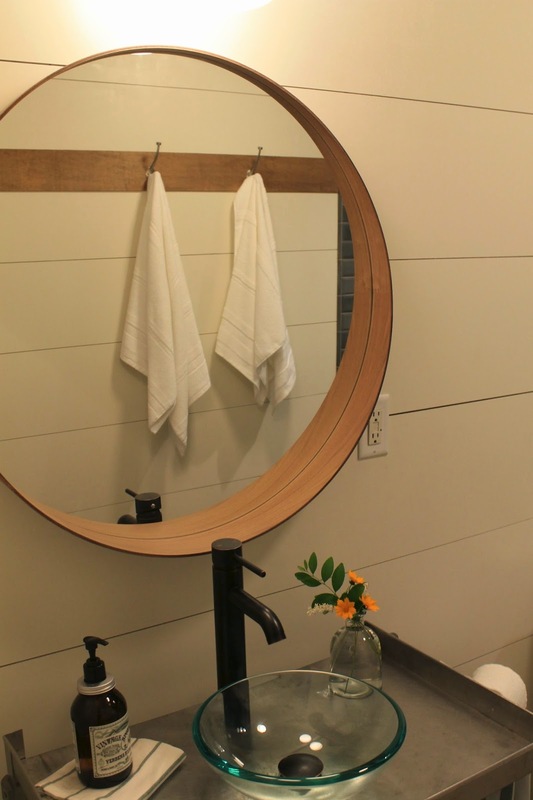 This big, round mirror helps offset all the hard lines in the space. It also compliments the round vessel sink nicely. Not the best picture, but it helps you see the shower panel. 99 cent art from Goodwill, purchased years ago but still going strong. And for your viewing pleasure, this is what it looked like a mere 12 weeks ago (although my hairstyle has changed at least 3 times since I actually took this picture). May these pictures never resurface again and please, please don't EVER add mirrors to every wall in your bathroom. Take it from me...it's not a good idea. I hope you've had fun following along with the progression of our remodels. I've had so much fun reading your comments and feelin' the love. It makes all those days of wondering if I'll ever get the paint off my hands and the dust off my floors, beds, tables, walls, etc, totally worth it! Thank you, Linda, for challenging us all through the One Room Challenge. You've managed to create quite the buzz in blogland! Don't forget to click through to see numerous other makeovers. 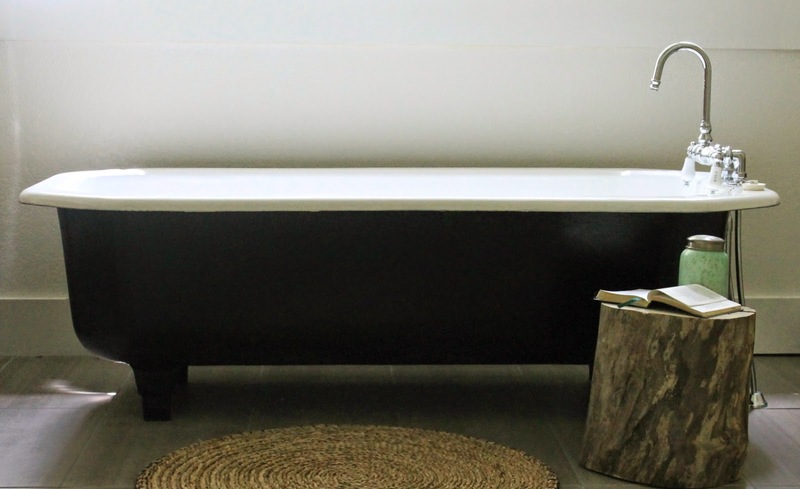 Lastly, check back in next week to see the real deal final reveal of our master bathroom! Both rooms turned out beautiful! I've been thinking about keeping our cabinets when we remodel our master bath next year, but I'm sold on replacing them now that I see what an impact you doing it in your space made. Enjoy the new spaces! Both bathrooms are gorgeous - although I can't believe you didn't want to keep all those mirrors! YIKES! 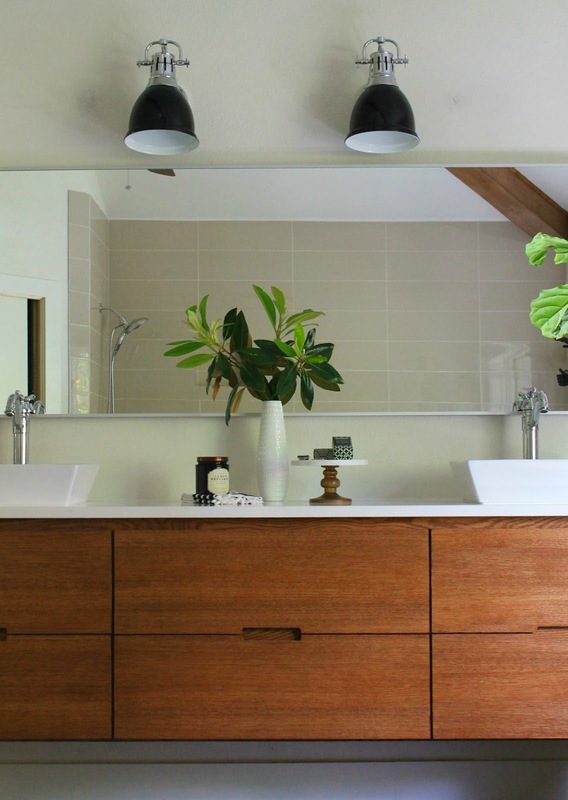 Love the utility cart sink - that is pure genius & that Stockholm mirror is the best! I used it a few months ago for a bath remodel myself. Congrats!! i'm speechless! really truly an incredible transformation for both baths. BRAVO! WOW, dana! just stunning!!!! i LOVE them both so much and am impressed that you got them both done! 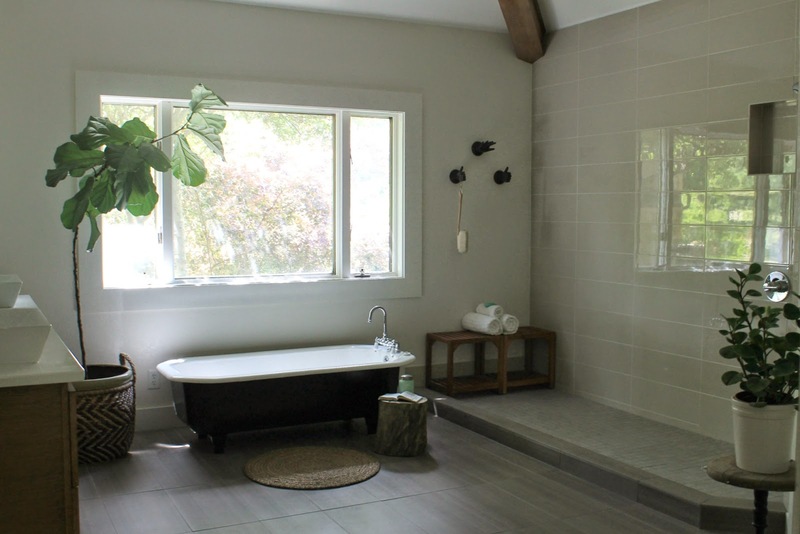 Dana you never cease to create the most intriguing spaces, even with your bathrooms! The vanity in the kids' bath - that is just awesome!! So many great details between the two rooms, congratulations on being done with those huge projects and bringing them into the new millennium!! They look fantastic! Dana! I looks fantastic. I bet you can't wait for you glass to get here. It makes me feel better that you took 12 weeks, as I am no where near getting done with my bathroom that I am doing! Can't wait for when mine is as polished as yours! Wow! What huge transformations! I can't even believe where you began with the way they look now. Gorgeous! And who puts mirrors on every wall in any room, let alone a bathroom?!? WOW! What a complete transformation! It's beautiful, way to go! 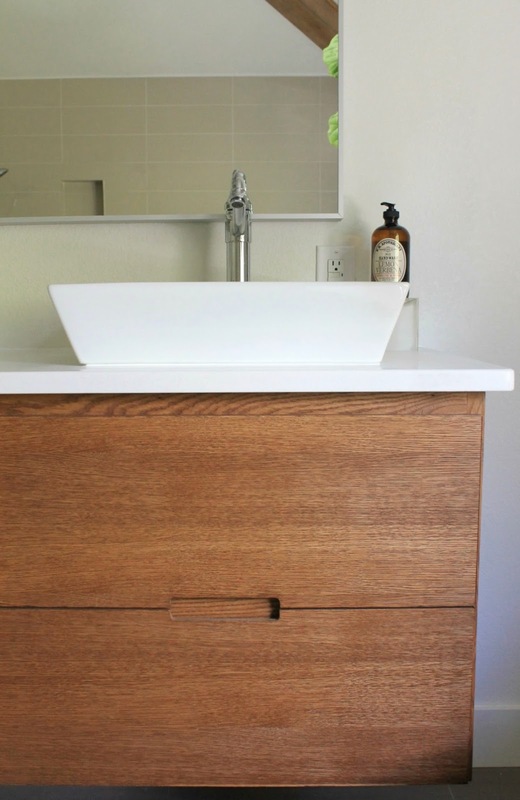 I adore both vanities. They are just fab!! Everything looks so amazing. I love the modern/clean aesthetic you brought to both spaces and it gives me hope that I can do the same in our traditional home. Incredible transformation! That tub is amazing! And I love that cart-turned-sink. It’s is gorgeous! What a difference! Amazing job!! WOW!!! Beautiful job! Really, though, how could you stand to let go of the mirrors? :) Enjoy your beautiful new spaces! What an amazing transformation! A true job well done. 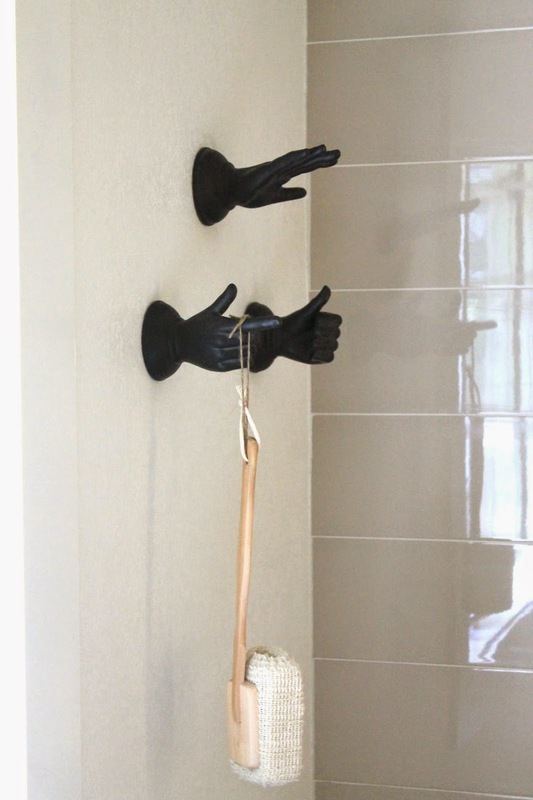 I just cannot get over that fantastic tub and hand hooks. The six weeks went by so fast. I completed our entry, living and dining areas in a new to us 30 year old house. So, cheers to us! Have a wonderful weekend. So many wonderful elements Dana! 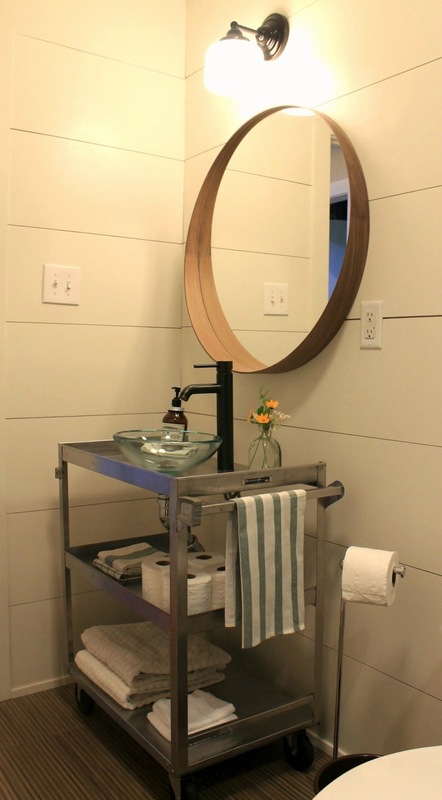 LOVE the cart vanity, LOVE the vibe of your master bath ... so many good things ... looking forward to Week7!! Oh My Goodness!! I love it!! What a transformation! It is really spectacular! Congratulations I love every little corner...and love the hands too! Chic and fresh...I just love it!! Wow! Everything looks fabulous. You must love your new bathrooms! 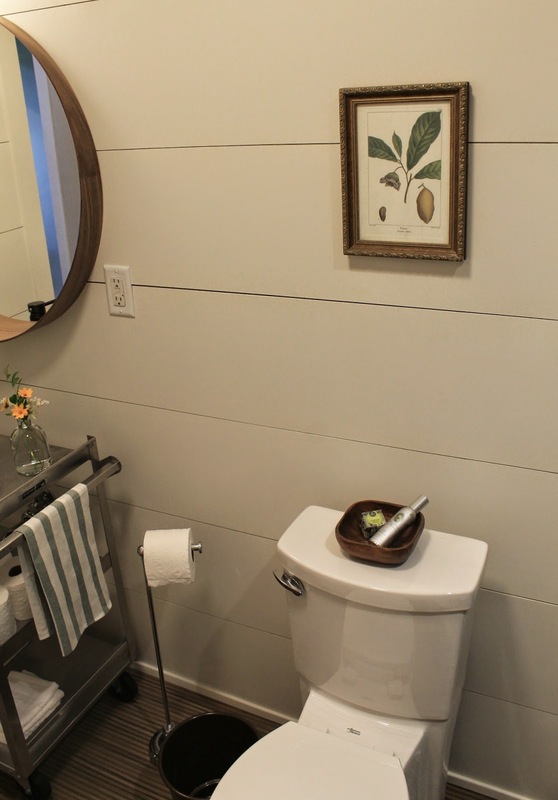 I wouldn't believe they are the same bathrooms if you didn't show the before shots! I love the floating vanity in the master, and the hand hooks are super cool. 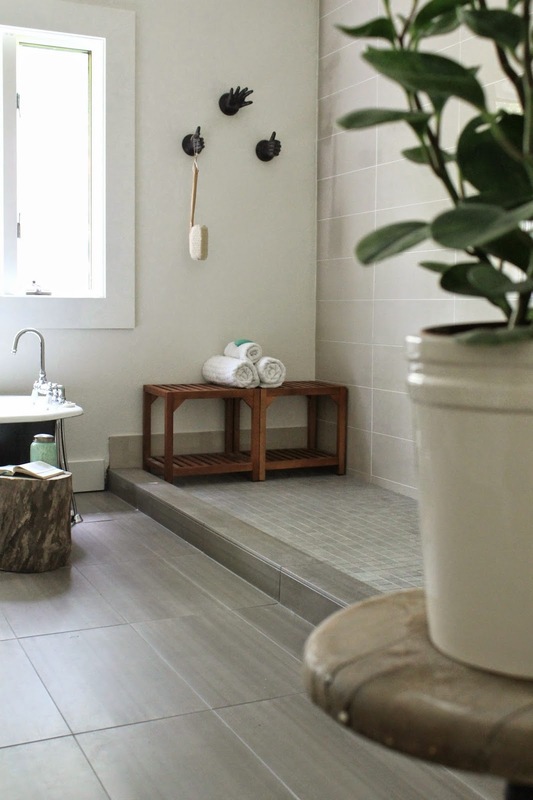 The guest bath flooring is amazing--I'm really impressed by how both baths turned out. Congratulations! Amazing!! Gorgeous spaces. Well done! Fantastic transformations! Love love love the unique claw-foot(ish) tub. 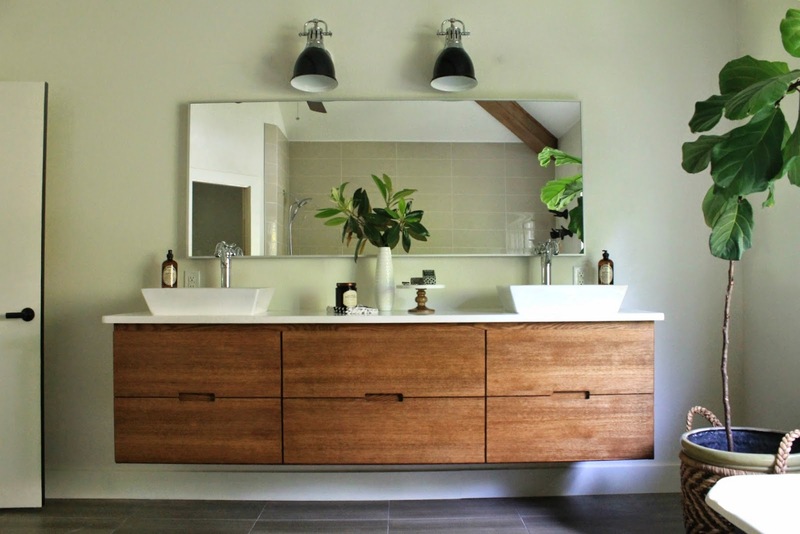 Great modern bathrooms, but I'm a sucker for the vintage touches, too! Dana, both of these rooms are SUCH amazing transformations! You all worked so hard and have so much to show for it. Absolutely gorgeous! awesome!! I want to come soak in your tub!!! Love the pic of you on the potty!!!! Whoa, those befores! 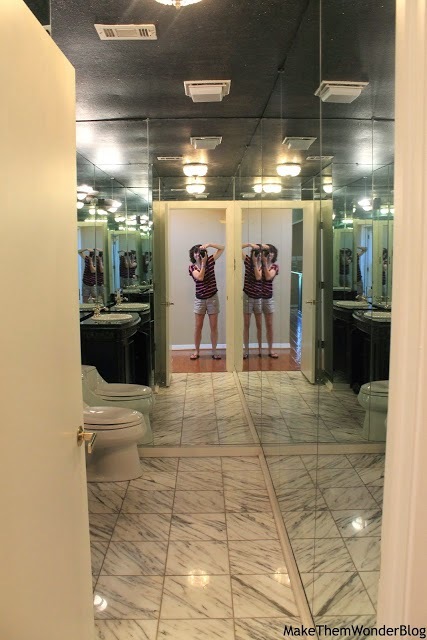 I have seen the "wall o mirrors" in a client's house once before - whyyyyyyy??? :) So many great, fun details here. 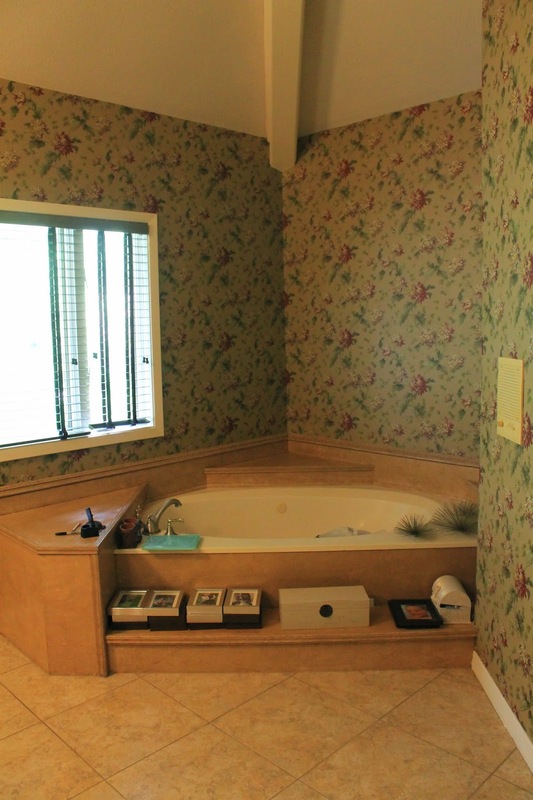 The vintage tub is ahhh-mazing. Congratulations! Absolutely AMAZING!!!! I LOVE EVERYTHING!!! Great job!!!! Holy bathrooms Batman!! This is incredible! I adore both of these and I adore your funky additions like the hands and that utility cart idea is killer (aka I might steal that!). 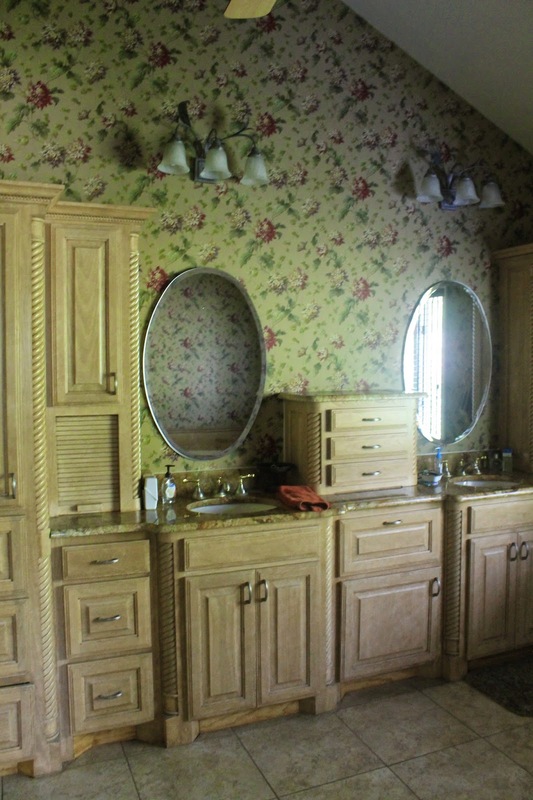 Love everything and cannot get over the before pictures (not sure I would have been able to use the mirror bathroom!). Well done! Remodel #1 looks like a spa! How fun are those hands?! And I still love, love the plank wall in bathroom 2. Great job and congrats on finsihing not 1 but 2 rooms! Wow. Wow. Talk about a night and day difference... 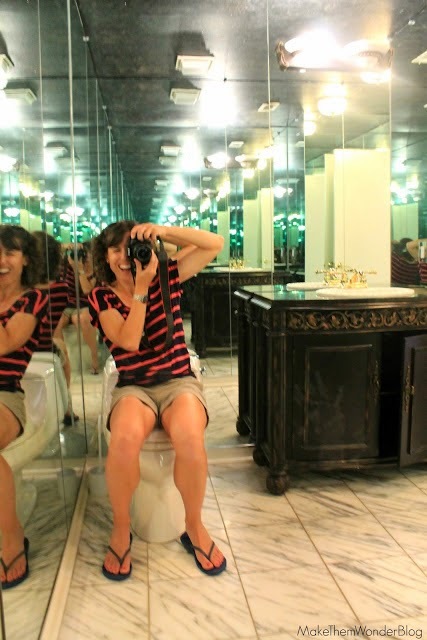 I was already loving both bathrooms, but when I saw the befores I was totally stunned. Way to reclaim your space! I am so happy for you that you now have two beautiful bathrooms and that you never have to see that wallpaper or those mirrors ever again! :) ALSO, I LOVE the hands in the shower, and I'm glad I'm not the only one with a hand sticking out of the wall in their ORC space! You lie....those are not the same bathrooms! Gah....Love...Love the vanity in the first one! Awesome job! Dana, this is double impressive. I don't know which is my favorite? I love both. 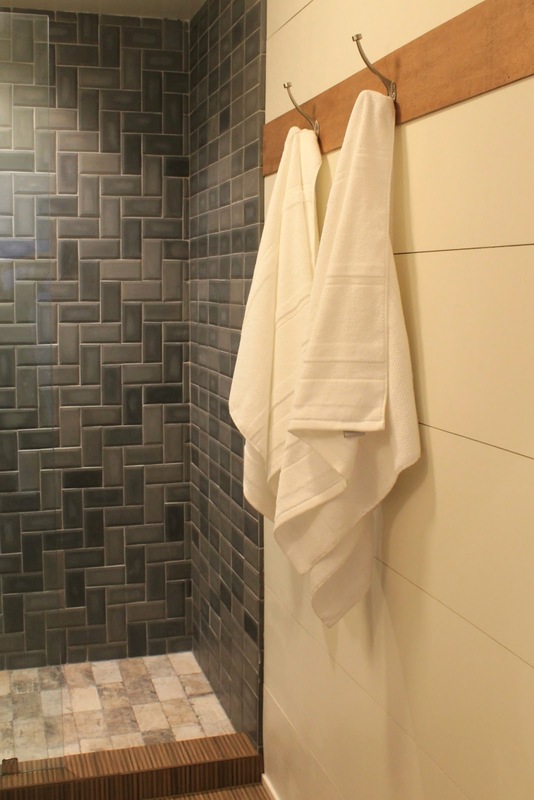 OK, I am seriously crazy over the herringbone tile pattern in the shower. You are a renovation queen. Great job. your new bathroom is gorgeous! I love how you blended vintage style with modern. Dana it's amazing! 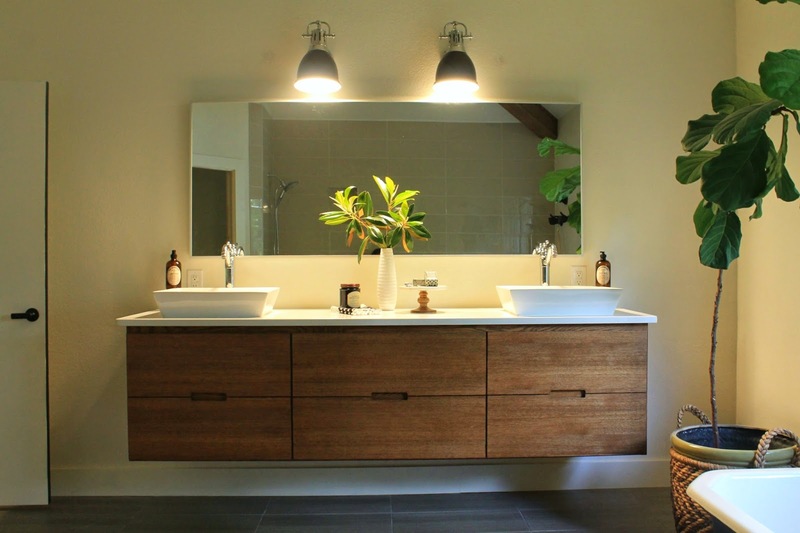 I love your open shower and the utility cart turned vanity is genius! Amazing transformation! Life has so gotten in the way for me and I'm so behind on blog reading. So glad I checked out your blog for this. Man this is so good. 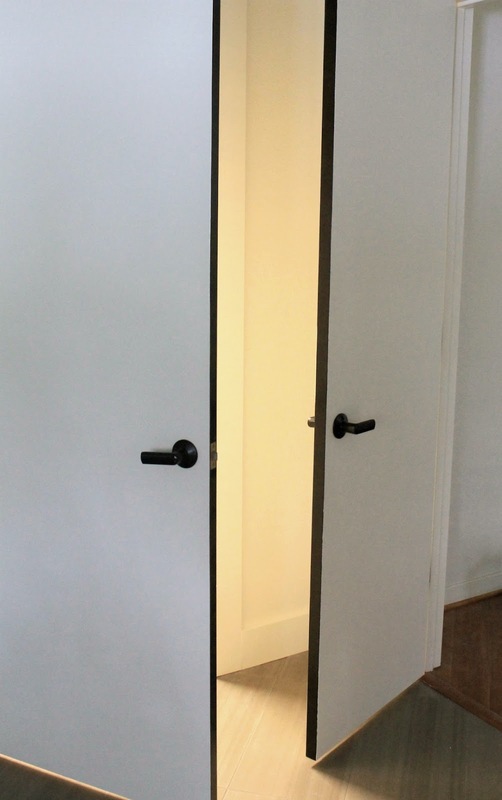 I've been planning on getting a floating cabinet too. Looks so amazing in your space! And that shower!!!! Those before and after photos are just awesome. Love what you have done. this bathroom is soo Gorgeous! It is so modern and clean looking. I’m really impressed. Wow! It is really beautiful! 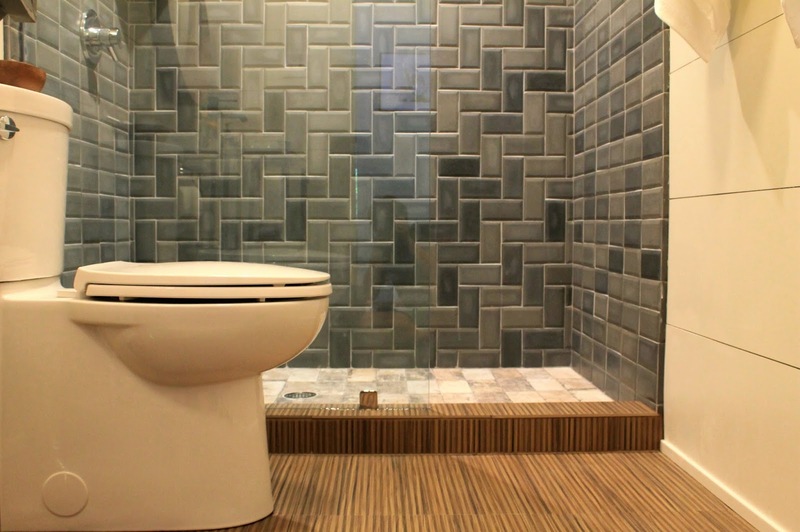 Love the cabinets, the floor and tub, You had a wonderful vision and executed it beautifully! Both bathrooms look just spendid! I love that modern design. I was just looking for some bathroom ideas for small bathrooms and huge mirror is something that would fit perfectly! Thanks for inspirations and I'm going to search your blog looking for more beautiful rooms!